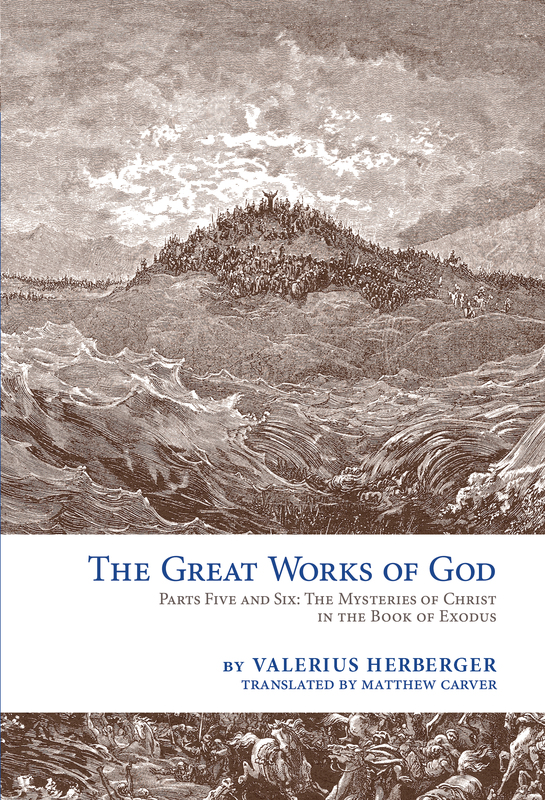 “Behold, I come, in the book it is written of Me.” With this “profound and wonderful word” Valerius Herberger began his remarkable set of meditations in The Great Works of God, Parts Five and Six: The Mysteries of Christ in the Book of Exodus. Now Matthew Carver has produced a highly readable translation of this Lutheran pastor’s devotional commentary. This is no dry academic work, although its author was by no means devoid of linguistic expertise and theological erudition. Rather, it is a series of animated exegetical studies, complete with vivid applications, that reflect Herberger’s conviction that the point of scholarship in the service of the Church is ultimately worship. Each of the 134 meditations begins with the word “Jesus.” Even though some 400 years separate our own age from that of Herberger’s, anyone who wishes to learn how to read the Book of Exodus from a Christocentric perspective today will find much that is still uniquely valuable in this splendid volume from Emmanuel Press. This entry was posted in Latest News and tagged Exodus, Great Works of God, Matthew Carver, Valerius Herberger. Bookmark the permalink.